Americans grew wealthier, traveled more, and demanded more exotic cuisine. Yet there were few trained restaurant cooks. Convenience food – in the guise of continental dishes (as in pineapple = Hawaiian) – offered the solution for many restaurants as the decade wore on. In other developments, old restaurant formats such as automats, diners, cafeterias, and drive-ins disappeared or shrank drastically in numbers. Fast food and dinner house chains, relatively scarce at the beginning of the decade, flourished by its end. Black Americans began to make headway in gaining civil rights in restaurants. By the middle of the decade signs of the counterculture could be seen here and there. 1960 New Armour & Co. boiling bags filled with beef burgundy, lobster Newburg, and coq au vin mean that “Every drive-in can now be a Twenty-One Club, every restaurant a Maxim’s de Paris,” according to a trade mag. – In Columbus Ohio the opening of the Kahiki adds to the Polynesian restaurant boom, while in NYC La Fonda del Sol opens, offering exotica such as Empanadas, Grilled Peruvian Tidbits on Skewers, and Papaya Filled with Fresh Fruits. 1961 In Sherman Oaks the Wild Goose adds four dishes to its menu: Boned Pheasant Chicken Kahlua, Veal Cutlet Oskar, Fresh Gulf Shrimp Stroganoff, and Breast of Chicken Kiev. – Four-star Lutèce opens in New York, one year after La Caravelle. 1962 A café in Sioux Falls announces “microwave cooking,” while in New York’s Time Square a restaurant opens featuring frozen entrees which the customer is to pop into a tabletop microwave. – A new product for restaurants comes on the market: instant mouthwash in a sealed paper cup to be presented to customers after they eat heavily spiced dishes. 1964 Continental and Polynesian restaurants find they must add steak to their offerings. – Kelly’s steak house in Sherman Oaks announces it sold approximately 400,000 pounds of steak in the past year. 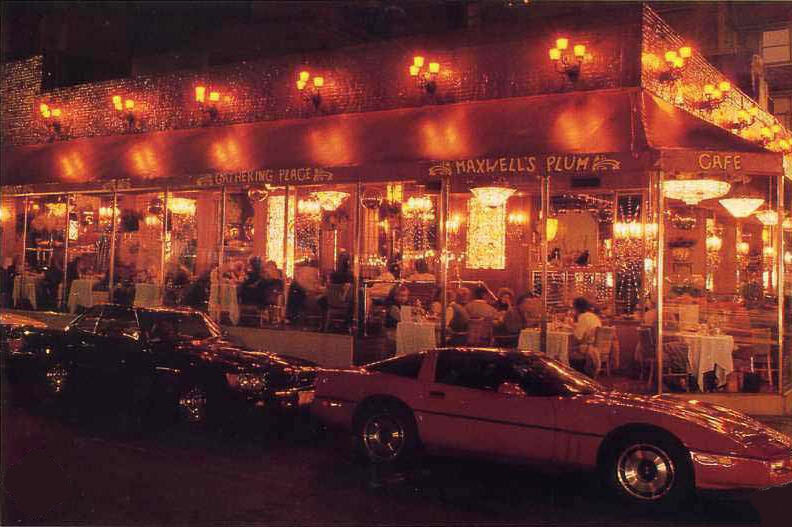 1965 Maxwell’s Plum opens in NYC with an eclectic menu that ranges from Pâté and Escargots Bourguignonne to a Foot-long Hot Dog with Chili. Rumors spread of a naked woman seen walking casually through the dining room. — Extra-thick Frymaster Jet Griddles are marketed to keep cooking temperatures stable even when “completely loaded with frozen food.” – Aggressively cheerful California-style coffee shops, which combine the features of drive-ins, coffee shops, dinner houses, and cocktail bars, spread across the country. 1967 Students at the University of Washington, Seattle, boycott Aggie’s Restaurant because they believe it discriminates against students, especially if they are dressed in “funny clothes,” following an incident involving a long-haired “fringie.” – The adoption of frozen convenience foods increases in restaurants after passage of the Minimum Wage Act which raises kitchen workers’ pay. Does anyone remember a restaurant in Kingston NY that burned in the early 1960s? The owner always entertained children at Christmas. I’m looking to see if anyone remembers a restaurant called Ruby’s Truck Stop on 17th State, in Milwaukee, WI. I think it was back in 1975 thru 1977. Ruby and Big Dave owned it. If anyone has any pictures of this restaurant or remembers it would you please let me know? Thank you. Does anyone remember the Bishops Perch in New York City? Owned by Tom James and Joe Nameth hung out there. Italian restaurant on Astoria Blvd. in the 1970’s near 86th Street in Jackson Hts. (East Elmhurst) Classy and very good food !! Please someone tell me the name !!! Does anyone know the name of a long since closed French restaurant in Stockbridge, Ma just off of Main St ? Does anyone remember the Idle Hour on Stony Island Chicago, Il. 1960s? Does anyone remember the pie chain that sold all different kids of pies in the New York/Long Island area in the 60’s? Can anyone remember Frisky’s in Des Moines in the late 60’S early 70’s? The owner was an art teacher, I think at East. Had the best gunie grinder, pizzas and onion rings. Larry, I remember it. We used to get a guinea grinder and onion rings every Friday night. I went to East, Classic of ’67. Thanks ladies for your replies. The owner was Bob Friskie or Frisk. I know a lot of people from East went there. Yes I think he has the best grinders and pizza in town. Bob Frisk was my father. He owned Frisky’s Drive In and was an artist. We served homemade pizzas, guinea grinders, tenderloins, onion rings and more – fondly remembered by many East Siders from the 60’s and early 70’s! Does anyone remember an oyster bar inside the Port Authority, NY, I believe on the 42nd st side? Port Authority BUS terminal @ 42nd St did not have an oyster bar as I recall, but Port Authority @ Cortland and Church Sts had a clam/oyster bar that was open 24hrs….this was in the mid 1960’s. Does anyone remember Tabletalk restaurant in NYC in the late 60’s? Yes! I remember it! on @2nd ave I believe. Does anyone remember the Tower Suite Restaurant on 6th Avenue in the 50’s in New York City? I do remember the Tower Suite and I went there once. It was the top floor of a midtown office building and it may have been owned by Restaurant Associates who operated many restaurants in midtown NYC. I’M TRYING TO RECALL WHAT I THINK WAS A FRENCH RESTAURANT IN DOWNTOWN D.C. DURING THE 1970S. ALL OF THE POWER BROKERS FREQUENTED IT. I RECALL THERE WAS ONE LEVEL AS YOU ENTERED AND THEN ANOTHER LOWER LEVEL. ANYONE HAVE ANY THOUGHTS? Chez Francois on K Street. Does anyone remember “The Huddle” a restaurant in Reno Nevada in the 1960’s? Any info would be great. Thanks! The garden room on the 7th floor. I do not know if it was the same restaurant, but I ate at one at Marshall Field’s in the mid 70’s where you filled out your order on a piece of paper and check marked what you wanted. There were a number of choices for each category – entree and dessert as I recall – and the menu changed daily. I worked at the U.S. Court House at the time and was a regular there and at Berghoff’s – which used to have a very reasonable special lunch menu. The restaurant was indeed in Field’s. It was called the Verandah (sp). One of the menu items was an open-face sandwich composed of rye bread, iceberg lettuce, swiss cheese, roast turkey and 1000 Island dressing. I remember it, when I shopped at marshall fields I always had lunch in the garden room..my kids were 2 and 4 so it was 1966-8. I lived in chicago for 2 great years then back to New Jersey. It was not at Marshall Fields. It was at Carson’s. I ate there many times when I worked downtown from 1976 – 1979. I do not recall the name. Does anyone remember a restaurant in the 60’s around Canal Street/Spring Street located in a Brownstone with dining in the backyard? Possibly starts with an “R”? Does anyone remember Lay’s Restaurant in Omaha Ne. in the 1960’s? I need a restaurant that makes a ‘reheated’ version of Coq au Vin. It tastes soooo much better when dish is allowed to rest overnight and the sauce has a chance to re-moisten the chicken. Pan American Airways had this entree from Maxim’s of Paris ….fabulous. Who knew anyone could be nostalic for airline food! Can anyone tell me the name of the French restaurant which was at 1540 Second Ave NY before it became “Pig Heaven”? You may be thinking of Ida de France, run by the Swiss-born Chiesi brothers, Alexander and Peter. Peter Chiesi, who founded the Hapsburg House at 313 East 55th Street, joined Alexander as chef at Ida de France in 1968. In 1970 Craig Claiborne reviewed the restaurant, praising its seafood crepes with Mornay sauce and watercress soup. He said it had a bistro atmosphere, with raspberry walls, posters, paintings, and plaster busts. It may have closed that year, when Peter died. In 1974 Szechuan East is listed at that address. Pig Heaven opened in 1984.